December 10, 2003 Cherokee took her second ocean run Sunday, reaching Cape Lookout from Gloucester in 15 minutes (Cherokee was able to get within five feet of the lighthouse shore!) and then out around the hook. Her top speed this time was 37.8 knots. Seas were moderate and she handled well. Now that the engines have been aligned and one new turbo and injector installed, mechanical work gives way to the finishing of the cockpit. 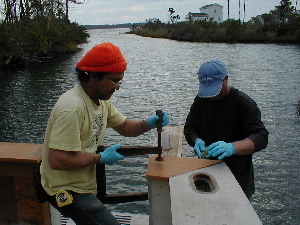 Below, Bryan and Leonard are installing the remains of the teak covering board that caps the transom and swim platform door. After patterns were made of luan plywood, the teak covering boards were cut and glued in place. 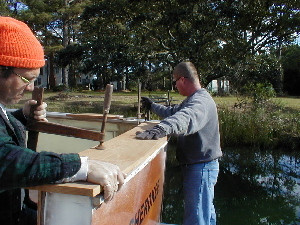 Below the guys work that last piece at the swim door joint before some unsettled December weather rolls in. Sharon Hunt and her brand new daughter-in-law Carolyn Brice have joined the crew to varnish everything else on the boat, and to keep up with maintenance varnishing. 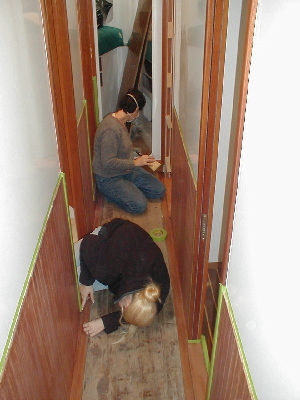 Below left they tackle the hallway wainscotting. 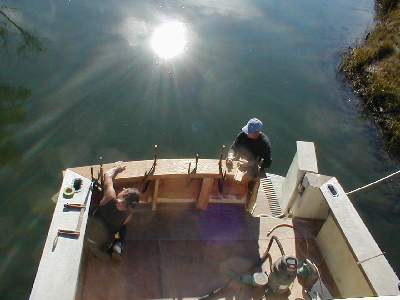 Below right, Chris Hunt (no relation to Sharon) is fitting the pieces of the teak border under the settee in the galley. Next the teak and holly plywood will be positioned. The border will be set on top, and the plywood scribed and cut before glueing. 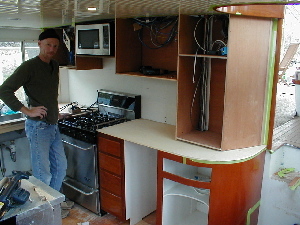 Above, Tom Parker is building the last set of galley cabinets to house the microwave oven, a variety of cookware, and two computers (one for navigation and one for DVDs, CDs, Internet, Solitaire, etc.). 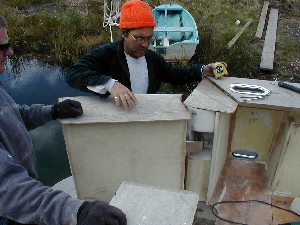 Tom also cut the counter, which will be covered in a white Swanstone composite. 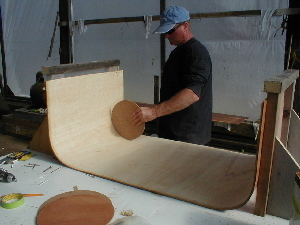 Leonard is fabricating pieces for the flybridge console. 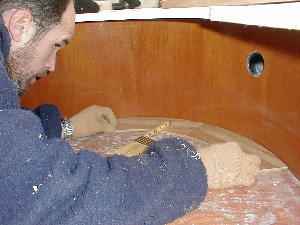 Below, he’s guaging the diameter of the round corners for a forward-facing, two-person seat attached to the console.